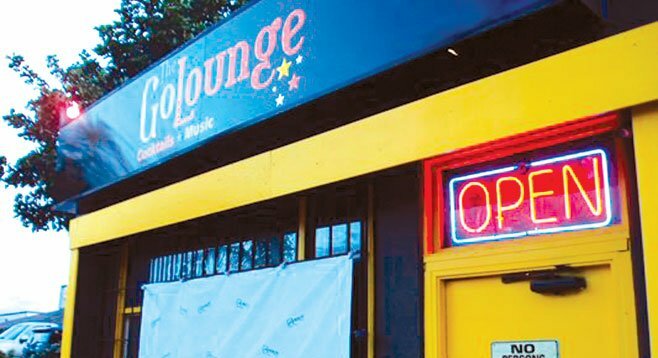 Nowhere near as seedy as the location’s previous incarnations — Mad Dog’s and, before that, Tommy’s — the Go Lounge is a welcome addition to La Mesa’s dive circuit. This vintage rock ’n’ roll–themed venue has excellent dive qualifications (budget beverages, a ready-made crowd of locals, zero pretense) and its own quirky flair. The result is an easygoing neighborhood bar that pours $3 happy-hour pints from 13 choice taps (add a shot of Jack for $2). Check out movie Mondays, local-music Thursdays. There are bands on Friday, DJs on Saturdays. Oh, and the bartenders aren’t dicks. Monday 4 p.m. to 2 a.m.
Tuesday 4 p.m. to 2 a.m.
Wednesday 4 p.m. to 2 a.m.
Thursday 4 p.m. to 2 a.m.
Friday 4 p.m. to 2 a.m.
Saturday 4 p.m. to 2 a.m.